Seagull Marina is located on the shore of Lake Michigan about 70 miles north of Milwaukee and 35 miles Southeast of Green Bay. We have nine acres of camping and marine facilities for your enjoyment. Our marina has water on three sides and is centrally located in Two Rivers and is only one block of home cooking, fast food, and fine dining. We are also just an easy walk to a park, playground, and the downtown area. Seagull is the only marina in Two Rivers you can get to without going under a bridge - or having to open a bridge. Our marina facilities include permanent and overnight dockage, gas, pump out, launch ramp, fishing licenses, fish cleaning station, fish freezing, complete fishing and marine supplies and live bait. In addition, number of excellent charter fishing boats call Seagull Marina home in the summer. We have a 5000 square foot service shop with three highly experienced technicians. 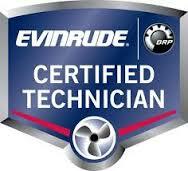 The technicians are certified Evinrude outboards. Our hydraulic lift trailer can handle power boats up to 37 feet and we can provide you with inside and outside winter storage for your boat. Our new boat and motor sales department specializes in Evinrude outboards and Mirrocraft boats. We also offer an extensive chandlery and rapid delivery on catalog sales for items not in stock. If a used boat is what you are looking for, we always have a nice range of units which are ready for immediate possession and launching. The RV Park is the largest and best in the area. It provides 100 waterfront campsites for RV and tents. With these campsites you have immediate access to a Lake Michigan sand beach, pier fishing, hot showers, ice, beer, sodas and snacks, launch ramp, and overnight slips. If you are looking for a friendly well equipped marina and campground to spend a few days, weeks, or months come on over and check out our staff and facilities. You won't be disappointed. Seagull Marina is adjacent to Mariners Trail and Rawley Point Trail. 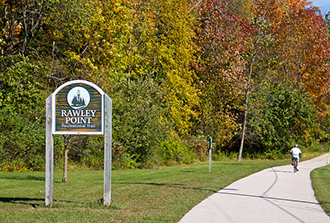 Both are each six miles of biking trails. SEAGULL MARINA SERVICE DEPARTMENT IS LOOKING FOR ANOTHER MECHANIC / PARTS SERVICE COUNTER PERSON.